A solid front roller reduced gouging during the wet and soft conditions of the winter. Two years ago when we got new mowers I was able to get 14 blade reels for my greens mower. Wow do they every produce a great quality of cut! At the same height of cut (HOC) I was able to get an extra foot of green speed. Struggling to get adequate green speeds became a thing of the past. We were also able to get walk behind quality from a triplex. SWEET! The only problem I had was that during the winter I struggled to keep the density up, and the aggressiveness of the mowers would gouge when conditions were soft. I LOVED the summer quality of cut but needed to come up with something for the winter. I had heard of guys using solid front rollers for bentgrass promotion with the theory that they produced less disruption. I'm not crazy pushing for bentgrass (at least not admitting to it publicly yet lol) but less disruption was exactly what I needed during the winter. 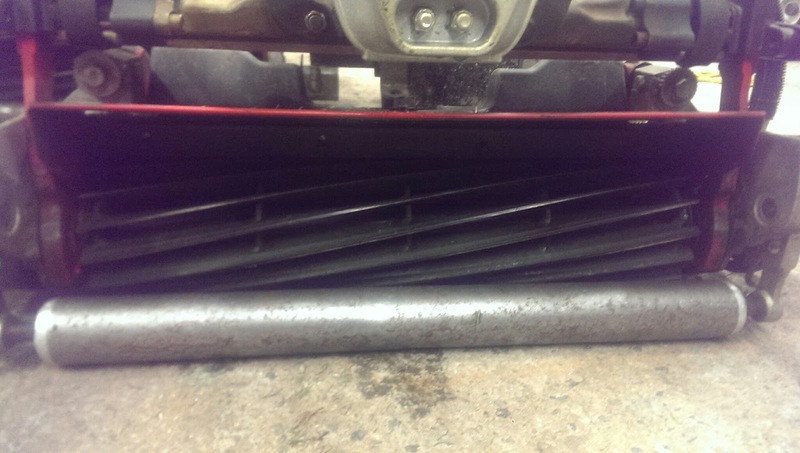 I slapped an old set of solid front rollers on my greens heads. I also set the HOC WAY UP! WAY WAY UP. The highest that I have even bench set my greens cutting units. We went at 4.5mm all winter long and only just recently lowered them to 4mm. Even so, the greens after a mow and roll were just touching 10' on the stimpmeter! That was about 2-3' more than I needed so I wasn't concerned about the 4.5mm being "crazy high." I even went a step further by slowing the reel speed. I wasn't too interested in removing too much grass in the winter as I wasn't growing that much grass either! This past winter the greens have never been better, smoother, or faster. A lot of that can be contributed to tree removal and abnormally warm temperatures but I feel that these modifications made a big difference. Going forward in the season I am going to leave the HOC where it is until conditions dictate having to go lower. I might even leave those solid front rollers on too! Either way, these reels are insane when you need them to be, but instead of having two sets of cutting units for each season, just make a few quick modifications and they will work great!